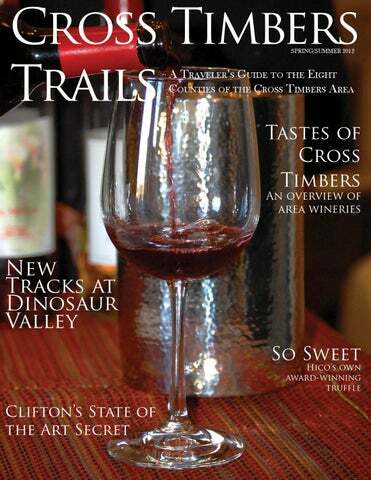 The Cross Timbers region is home to a handful of family-owned and operated wineries, each offers the visitor something different. The Bosque Arts Center is nestled in small-town Clifton, leaving visitors in awe. The story of Wiseman House Chocolates in Hico. Enjoy true Texas BBQ, Red Dirt Music, and good family fun at The Rio. Last summer’s drought had everyone feeling the heat, except Dinosaur Valley. Eating at Mary’s Arguably the best chicken fried steak in Texas can be found in Strawn. Cover photo by Heidi Smith. All “Snapshot” information taken from Handbook of Texas Online and the Census Bureau. Letter from the Editor Whether it is the rolling hills of Somervell County, the small-town comfort of Eastland County, or the calming uniqueness of Hamilton County, the Cross Timbers Area has something to offer everyone. This very diverse area encompasses Bosque, Comanche, Eastland, Erath, Hamilton, Hood, Palo Pinto, and Somervell counties. If museums and art fancy your interests then take a short drive to Bosque County where you can see art from all over the world. Located in Clifton, Nicole Hengst the Bosque Arts Center houses artwork from both local and global artists. Graphic Designer Each year a new piece of artwork is added to its large collection after the Bosque Art Classic Show in September. This show is nationally-recognized and judged by some of the industry’s finest. History, dinosaurs, and exotic animals roam through Somervell County. Home to Dinosaur Valley State Park and Fossil Rim Wildlife Center, you are able to see rare dinosaur tracks and visit with rhinos. Take a drive through Fossil Rim’s 1,500 acres and see more than 1,100 animals representing 60 different species. Fields and pastures filled with cattle and horses show a rich western way of life and true Cowboy traditions. Home to many of Professional Rodeo’s All-Stars, Erath County is known as the “Cowboy Capital of the World.” Stephenville is also home to the Cross Timbers Fine Arts Council, which fosters a flourishing art community. Within Erath County, Tarleton State University makes its home offering a diverse and unique learning environment for students. Radio stations KTRL and KURT are student-run and produced, broadcast from the TSU campus. KTRL is the Cross Timbers Region’s National Public Radio station. While KURT offers various radio shows and personalitites filled with the latest musical hits. KTRL’s coverage overlaps the Cross Timbers Region, and KURT reaches the locals in Stephenville. Take this magazine, and explore! Visit the places and see the faces of what makes the Cross Timbers Area so unique to its residents and the Lone Star State. Happy trails! Family atmosphere, great home cooked food, and wonderful service are just a few things which set Fiddle Creek Steakhouse apart from the rest. I remember my first visit to Fiddle Creek like it was yesterday. Upon entering we were greeted in a rustic western style entry way by their hostess. Straight ahead through the saloon style doors sits the bar area. To the left is the dining room. We were seated at a large table big enough for the whole family, whcih is difficult to find in a small town. Old pictures and brands from locals serve as decoration in the resturant. It was so cool to ask servers questions about the various brands and see all the old pictures. Our food was DELICIOUS!! The rich flavors in the steak and crispness in the salad made for a very happy family. Fried pickles are a must with my family and Fiddle Creekâ&#x20AC;&#x2122;s are to die for! Full of flavor and made fresh when you order. My family has been going to Fiddle Creek for years. From large celebrations and family get togethers to small date nights with my husband, Fiddle Creek is able to accomodate. Each time offering the same great service and delicious food. This is what keeps customers coming back day after day. Sincerely, Sarah Smith Fiddle Creek is open Tuesday-Thursday 11am- 9pm; Friday and Saturday 11am-10pm; and Sundays 11am-9pm. They can be reached at (254)968-7500.
a commercial pecan operation until he was able to own an orchard of his own. He is also a member of the Texas Pecan Growers Association and serves on the Ag Texas Board of Directors. Gayland worked full time alongside his father after graduating from Tarleton, and eventually purchased his own orchard. He has served on the Texas Pecan Growers Association as well. Kinley acknowledges the rest of the hands working at Sorrells Farms, family or not. The quality of the products, he says, is a direct result of “the work of conscientious employees.” Sorrells Farms effectively ties together both concepts of humble beginnings and widespread success, which customers can see as well as taste. has been involved in many art projects since, including the Outdoor Art Exhibit in Eastland. She earned a master’s of A.R.T.E. at the University of North Texas with a minor in metals in 2005, and went on to teach at Howard Payne University from 2005 to 2010. When asked about the Outdoor Art Exhibit, Ball said she just “wanted to bring art to the people in her community.” Once she involved kids in the classroom, the community came together. All in all, 144 people helped with the project, which took three years to get started and three years to complete. To pay back many who made donations, Ball gave art lessons in her studio, which had been converted from a garage by her husband. She feels that the project is complete and doesn’t plan to add any more artwork to it. Other projects of Ball’s include one in which she and 96 students covered the windows of an old hotel with 114 board feet, then proceeded to paint it to look like the inside of the hotel was open and running. She also helped begin an outdoor art museum in Sedan, Kansas, after becoming well-known for her efforts in Eastland. Ball is the author of ‘A Lick of Sense’ and ‘A Lick of Sense II,’ in which she passes on cowboy wisdom through Pastor Paul Howie and Dixie the Cowdog. Among her many skills, Ball interprets for the deaf, attended cooking school, has her pilot’s license, weaves, and welds. arleton State University communication students are doing some incredible work. You’re holding the most recent example of that in your hands. Cross Timbers Trails is a start-up magazine written, photographed, edited and designed by journalism and broadcast students in the Communication Studies Department of the College of Liberal and Fine Arts. We hope you enjoy the first issue of Cross Timbers Trails – and look for more good things to come from Tarleton communication students in the future. •	Publish a news website with the latest in news from the campus and the world? Or tell the news in a four or five day a week video broadcast. Check out www. tarleton.edu/texannews •	Research social media alongside faculty members from various disciplines as part of the Texas Social Media Research Institute, the first of its kind in the state of Texas. •	Gain real-world experience with profit and non-profit clients of Legendary Weddings & Special Events, a lab operation for the Public Relations and Event Management program that provides experiences typical of professional practice. •	Operate two radio stations, KURT 100.7 FM and KTRL 90.5 FM. Students work in all aspects of broadcast operations, including management, music, news and sports, preparing students for jobs in the music and broadcast industry. ross Timbers Fine Arts Council’s mission, accomplished through innovative partnerships with art and non-art constituent groups, is to “make the arts accessible, support, promote, and increase awareness and present fine art events that inspire, educate and entertain the citizens of the Cross Timbers Basin.” These programs are often the only opportunity that many citizens have to experience the arts firsthand. A viable and dedicated volunteer organization of more than 300 individual members, the CTFAC is governed by a volunteer board of 14 directors who are elected to three-year terms and meet monthly. The council employs a full-time executive director and administrative assistant who work with the board to manage CTFAC’s growing business and financial affairs. 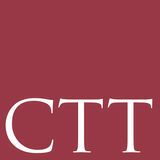 CTFAC annually sponsors or co-sponsors 15-20 events. Kayla Fritz sat down with Julie Crouch, CTFAC’s executive director, to answer a few questions. Q: When you mention the Cross Timbers region and people might think about western heritage, rodeo, or ranching. Why should they think about art? Can you describe the breadth and reach of the arts community in the region? A: Art is a reflection of the community it serves and great things are reflected here. From ballet to modern art – our mission is to provide a wide range of arts experiences to an audience of all ages. Q: How long has the Cross Timbers Fine Arts Council been available here in Stephenville? A: The Cross Timbers Fine Arts Council was founded in 1980 by Connie Birdsong. Q: Have there been any prior locations? A: Our office was previously located at the Stephenville Parks and Recreation hall, prior to moving to our current location in 2001 at 204 River North Blvd. Q: What types of artists are displayed? A: Our exhibits have featured a wide range of ages from students as young as 5 and older. Q: What varieties of art and styles have been displayed? A: We have exhibits that include photography, sculpture, collage, watercolors, oils and acrylics on a variety of mediums - and more. A: The beauty of what we do as an arts council is to provide art experiences to everyone. And each person experiences our exhibits differently. Q: What else should we know about CTFAC and the arts in the Cross Timbers region? A: The CTFAC’s River North Gallery is proud to host 12 exhibits a year to feature a wide range of local artistic talent. Last year we featured recycled artwork from Stepheville High School and Tarleton State University students, Opal Black and her students, Pat Shoemake’s hand-hooked rugs, Ethel Lewallen, and the Town and Country Quilt Guild to name a few. Another example is Robert Summers of Glen Rose who was commissioned to create the bronze of John Wayne at the Orange County Airport in California – among many other prestigious commissions. http://www.summersstudio.com/ Q: What is the most interesting work you have had displayed? Q: Do the small towns of the Cross Timbers have many artists, or is Stephenville the main contributor? A: We have a committee within our board of directors who reviews the requests for exhibits. They are currently updating our guidelines for 2013. In August, we are excited to feature artist Martin Grelle who is very well known nationally. Q: What requirements, if any, are there to be a part of art events and displays? A: There are a surprising number of artists in our area with national prominence. A: In my experience, the events that involve children attract the most members from our community. Q: Could you name a couple of prominent artists in the area? Are there any of national prominence? Q: What events bring in the most attractions? A: I am always surprised at the number of wonderfully talented artists from our smaller towns. For example, our current exhibit features three artists from Lipan. ith the arrival of summer just around the corner, now is the perfect time to tour the beautiful wineries of the Cross Timbers. Start your tour in Granbury, Tolar, Comanche or Meridian. Each is home to a beautiful winery. Because the Cross Timbers region is quite small, making the loop can be done in a day’s drive. The most popular wine, Nexus, is a sweet red which compliments any spicy Italian or Mexican dish. In September of 2011, Bluff Dale was awarded First Place for Red Proprietary Blends in the GrapeFest competition. With the weather being so unpredictable during the summer, the owners usually harvest in mid-August, earlier than most vineyards. Owner David Hayes says he “can grow all kinds of grapes in this area, because Texas weather is so temperate, some may not do as well as others but we still have a great variety.” Bluff Dale wines can be found at H-E-B grocery stores or your can stop by the tasting room. Bluff Dale Vineyards is located at 5222 County Rd 148 Bluff Dale, or call them at 254-728-3540.
arking Rocks Winery in Granbury is just 45 minutes south of Fort Worth. Because of the difficulty in growing grapes in this region, owner Tiberia (yes, that’s the only Bluff Dale Vineyards owners David & Theresa name he’ll give) says, “every year Hayes. we make different wines, sourcing grapes from different places.” By room and patio, which overlooks the doing this, they do not have a signarolling hills of a vineyard blanketed ture wine, yet a wonderful collection with rows of grape vines, makes enust down Highway 16 through of unique blends. Currently on the joying a glass of wine a memorable Stephenville and Dublin, sits Brentasting profile is the 2005 casena, a experience. blend of merlot and syrah, which won the Limited Production Category in the Bluff Dale Winery guests enjoy a glass of wine and the view on the patio. 2006 Lone Star Park Wine Competition. The rustic old barn and old world traditions of making wine sets this winery apart from the rest. “Making wine, friends, and events happen” is how Tiberia describes the winery’s mission. Barking Rocks wines aren’t available in stores, only at the winery. So stop by and enjoy good wine, the company of friends, and live band entertainment the first Friday of every month at Barking Rocks Winery in Granbury, located at 1919 Allen Court. Or call them at 817-579-0007. Trail nan Vineyards in Comanche County. Between the legendary Hill Country and Texas High Plains, Brennan Vineyards benefits from the wonderful soils and picturesque scenery. The winery’s fine dining restaurant provides romantic environments for any occasion. Built in 1879, the McCreary House, one of the oldest remaining homesteads in Texas, serves as Brennan Vineyards’ tasting room. “Sophisticated wines with Texas roots,” is the motto. With a variety of wines including syrah, cabernet, and viognier, Brennan has something to offer every taste bud. Grapes are harvested at their peak, processed with a combination of old-world traditions and high-tech innovation with the end product being award-winning wines. Brennan Vineyards only ships within the state, and North and South Carolina. Brennan Vineyards is located at 802 South Austin St or call them at 325-356-9100. Red Caboose Winery Owner and Architect Gary McKibben and Winemaker and his son, Vinyeard Manager Evan McKibben. Red Caboose will be hosting its RCW Blue’s Weekend, a three-day Blue’s celebration during tax season. Red Caboose Winery is located at 1147 CR 1110 Meridian, or call them at 254-435-9911 or 903 S. Avenue G. Clifton, or call them at 254-675-009.
ake it a day trip, or a weekend adventure, either way, Cross Timbers Trails makes it easy! Take a look at our lodgings section to find a quaint place to rest during your stay or somewhere to eat. Above all else, enjoy your time with friends and raise your glass to Texas. Jessica Harper and Chris Starnes also contributed to this article. Station manager Eric Truax sat down With Jenny Cline to answer some questions. Eric Truax KTRL and KURT station manager. Photograph by Sarah Friesen. he Cross Timber region is home of a relatively new National Public Radio affiliate, KTRL 90.5 FM. Eric Truax, who also teaches and oversees KURT 100.7 FM, the student-run station at Tarleton State University, manages the station. His interest in radio stems from childhood, while growing up in a military family living in Germany, his family would gather around the radio (for English language broadcasts) like other families gathered around the television. Heâ&#x20AC;&#x2122;s been an on airpersonality and station manager since the late 1980s. Jenny Cline recently sat down with Truax to talk about the future of radio and NPR. Students produce live radio show in the Tarleton State University station. Photograph by Sarah Richards. Student Tammo Mellema, production director, helps produce a radio show at Tarleton State University. Photograph by Sarah Richards. would choose radio: it’s got better pictures. Q: Satellite radio, do you think of it as a competitor, is it a threat? Q: What is your vision for KURT and KTRL? A: Radio is Radio, people’s attentions are split, pulled in different directions. I think that satellite radio affects the total time that they spend with broadcast radio or KTRL. A: Right now KURT and KTRL are the only broadcast outlets for Tarleton. We’ve got a great opportunity here. I’d like to see us grow into more of a regional media center where students and professionals can work together in a converged multimedia environment. Q: What does being an NPR affiliate bring to the table? A: It brings to the table NPR news, the best broadcast news in America. 27 million people each week tune in to NPR in the United States. This is better than CNN, Fox, ABC, CBS, etc. It brings to the table objective, awardwinning journalism that gives a chance for people to be informed about the world around them and it gives students a chance to hear good, objective journalism. Q: How would you describe KURT or KTRL’s listening demographic. A: Smart people. Seriously, KURT, we’ve made an educated guess that we have a pretty adventurous group of 16-25 year olds, high school, college age, and they want to hear new music. They’re interested. The KTRL listener is similar. They want to know what’s going on in the world. They are engaged in their community. I think they like KTRL because we respect them. We’re not dumbing down our programming like a top 40 station does. We’re not playing the same thing over and over, once or twice an hour even, like some of these stations do in Dallas. KTRL is located on the campus of Tarleton State University in room 138 of the Math Building, which is building 509 on the campus map. They can be reached by phone at 254968-9586.
ico’s claim-to-fame, the Wiseman Chocolate House, was built in 1903 by artist Rufus Wiseman. The building was brought to life when Kevin Wenzel and his wife, LaDonne, opened the doors to share their products. The building now boasts the title of the best chocolate truffle in Texas. Prior to opening the doors of the Wiseman House, Wenzel took classes in Pennsylvania and learned the best chocolatiering techniques. His passion for chocolate and treats became a recognized art and his appreciation for history makes the chocolates that much more appealing. The Wenzels, who moved to Hico in 1996, transformed the Victorian home into a chocolate craver’s dream. “When Kevin bought the house, he renovated it, and while he was doing that he started the Hico Historic Society. County Since the debut of their website, business has really picked up for the small-town chocolate factory. The Wiseman has even started selling wholesale to companies across the state of Texas. “We actually don’t have a location outside of Texas but we ship nationwide,” said Finch. Holidays are always a hectic time for consumers and the same idea rings true for the Wiseman House. “Christmas is our busiest holiday. Our business picks up the first of November and doesn’t slow until the first of March,” Finch said. Even if it’s not the holiday season, the Hico Hills Inn Wiseman House has something for every one. Whether you desire dark chocolate, 401 North Railroad Ave, Hico melt for milk chocolate, or just prefer 254-796-4217 the toffee taste, Wiseman has all your chocolate-craving needs. If you would Hico’s Almost Home Bed & Breakfast like to learn more about the historic 102 Rogers, Hico chocolate house, the Wiseman even 254-796-4789 offers classes to help customers learn the art of chocolatiering. They also provide guided tours to learn how the pros create Hico’s Nothin’ But Time Bed and that perfect piece of chocolaty paradise. Breakfast 306 Hickory, Hico The goal of the Wiseman House is to 254-796-4666 become recognized as the “Premier Texas chocolate company,” said Finch. Other historic societies and surrounding towns expressed their gratitude that he brought the house to its former glory,” said Crystal Finch, director of operations at Wiseman. “It’s worth coming just to see the house.” The Wiseman House participates in various tasting events through the state and even some outside of Texas. The most prestigious event the Wiseman House has catered at was the Inaugural Ball in Washington D.C. for President Barack Obama. Finch, who has worked at the Wiseman House for 5 years, helped put together the event, but Wiseman and his father actually attended the event. The Texas Society put on the ball and afterward the Wiseman noticed a boost in sales. large stage and hear the rich sounds of the music. Rio Brazos offers the perfect setting to hear live music, dance, relax, enjoy a full bar, and Texas smoked barbecue. For at least 10 years, owners Jim and Tracy Hartman have hosted New Year’s parties with live music at their home in Granbury. They saw a “void in entertainment” in this area. “Jim and I are both huge music lovers, in particular of Country and Texas Red Dirt music,” Hartman said. ranch” Built on 35 acres, Rio Brazos hosts winter concerts in a 15,000 square foot heated tent that will hold 2,000 people. In warmer weather, there is an outdoor stage area that will hold 10,000 people. The next phase will include an R.V. park and resort on part of the property. Owner Tracy Hartman said, “We like to say that Rio Brazos is Texas’ newest-oldest dance hall, due to its rustic feel with modern amenities.” There are hundreds of Texas dance halls across the state today. Centuries ago, there were thousands, according to Texas Preservation, Inc. In the 1800s, German and Czech immigrants built a number of Texas dance halls for meeting places to preserve their heritage. Eventually, the dance halls began serving as public performance sites where everyone could enjoy getting together. A very fitting artist, Willie Nelson, performed at Rio Brazos for the grand opening last fall. He has been playing in dance halls since the 1940s as a teenager. Other entertainers at the Rio range from old-style Country great George Jones to the Bellamy Brothers to Casey Donahew, Wade Bowen, and Randy Rogers Band. There is always live music on Thursdays through Sundays at Rio Brazos. “We will bring in bigger venues every couple of weeks,” said Tracy Hartman. For a calendar of events, visit www.riobrazoslive.com. The Rio Brazos Texas Music Hall is located at 6611 Glen Rose Highway between Glen Rose and Granbury or call them at 817-579-0808. County to enjoy a cold Shiner and a chicken fried steak at Mary’s. Though café namesake Mary Trenner derives the majority of her business from out of town, you are sure to find a few faithful locals in the café most nights. Recently, Trenner made a few improvements to the exterior of the café. A new sign, rockwork, and cedar beams have been added to renovate the overall look to the once 1920s service station. Along with this, she has added a beer garden for groups waiting on an open table, or for the social The sun sets on a busy afternoon at Mary’s Cafe. crowd that just isn’t quite ready to leave yet. Mary’s Café is located at 119 Grant Ave in Strawn. They are The café also takes reservations if open from 11 a.m. to 11 p.m. 363 you are going on a weekend evening days a year, closed on Thanksgiving and you don’t want to wait for up to and Christmas. Stop by and visit Mary’s or give them a call to make an hour or two for a table. reservations at 254-672-5741. Palo Pinto County Every Thursday through Saturday 10 A.M. to 3 P.M. Above: Lifesize replica of a tyrannosaurus rex. Left: Another replica of an apatosaurus. Photographs by Justin Green. when the dinosaurs walked in the soft, limy mud that used to be part of the Gulf of Mexico. When the mud was filled with new sediment from bordering lagoons, the footprints became preserved in the rock. Dinosaur tracks set in stone at Dinosaur Valley State Park. Photograph by Robyn Dabney. The park also has two lifesize fiberglass models of the relatives to the dinosaur tracks found at the park. The 70-foot apatosaurus model and 45-foot tyrannosaurus rex model were donated by the Atlantic Richfield Company. These models were from the 1964-1965 New York World’s Fair Dinosaur Exhibit. The opportunity to see these tracks are so unique that even the American Museum of Natural History in New York extracted a sample of one of the Dinosaur Valley tracks to put in its museum. Dinosaur Valley is located at 1629 Park Road 59 Glen Rose, or call them at 254-8974588.
to get your ad in our next issue!! Fossil Rim Wildlife Center A 9.5 mile scenic wildlife drive to see exotic and endangered animals.